Not to be confused with the clichéd Hollywood movie of the same name, South Pacific from BBC Earth is one of the most impressive documentaries of 2011. Narrated by Benedict Cumberbatch, South Pacific runs at a whopping 5 hours and 54 minutes that goes into extraordinary detail of life within this region of the planet. To compliment this insightful and acclaimed documentary series, the video quality on Blu-ray is quite stunning and almost makes your TV come alive from its tropical colours to amazing creatures and cultures who live within this part of the world. The series does not revolve around just "life" but that of the planet from volcanoes to cyclones which causes a ripple effect throughout its waters. It's interesting to see how these elements effect the South Pacific and creates quite a holistic series. The series encompasses the shores of Hawaii to that of Easter Island and all the little islands that that are scattered from one point to another. With scientific theories on how these islands were populated by life to the threat of mankind, I have never been so glued to a documentary in quite some time. Thankfully the information is quite down to Earth as opposed to in your face or too grandeur. South Pacific also has more animals than you can point a stick at such as elephant seals moving through thousands of penguins who happen to be the only tropical penguins in existence. With ample food and plenty of water, these penguins flourish within the South Pacific. Then you have the world's largest invertebrate, the Robber Crab that is like a Hermit Crab on steroids and weights up to 4 kilograms with legs up to 1 metres in length. Even stranger are the monkey-tailed skinks to carnivorous caterpillars and South Pacific really opens your eyes to the wonders of this planet. Mankind plays a role in this documentary as well such as the Pentecost land divers who leap from wooden scaffolds with vines used to breaking their falls. Obviously this cultural act inspired modern day bungie jumping. Or the Papuans who have over 700 different languages to strange Samoan ceremonies where men mutilate themselves to look like crocodiles, animals are not the only interest in this series as it is steeped in human culture as well. Fascinating to say the least! The BBC are once again the paramount forefathers of high quality video and South Pacific only cements this fact. The most memorable scenes for me, besides all the wildlife and amazing close-ups is the surfing segment. It's almost like you are watching a 3D presentation, thanks to the FULL HD video, especially when it is displayed in slow-motion... it is crystal clear. Another highlight of the video is the Bird of Paradise that really showcases the amazing colours of this creature that is brought to life on Blu-ray through its myriad of colours. 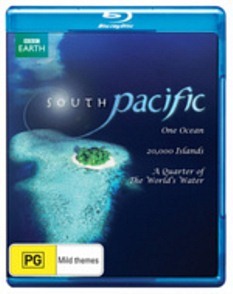 Overall, South Pacific boasts vibrant colours, exceptional sharp images that makes full use of the Blu-ray format. Add in a DTS-HD MA 5.1 soundtrack and it's almost like you are sailing in the Pacific with each episode complimented by David Mitchell's remix of Somewhere Over the Rainbow. Brilliant! South Pacific is a must have documentary that showcases the variety of amazing creatures on this planet from giant crocodiles to foot long millipedes to beautiful tropic beaches and amazing cultures. It will draw you in from the very first episode and will keep you captivated from start to finish. On Blu-ray, the video and audio quality is perfect and it only enhances this amazing experience of this must own documentary series.